Check out our review of the Nokia Lumia 521 phone. At Mobile World Congress in Barcelona, Nokia started off their press conference by crowing about its status as the maker of flagship Windows Phones. To further cement that position, it introduced two new Lumia phones, only one of which is coming to the United States: the Nokia Lumia 520. This 4-inch phone will have an Asian launch in March and expand to the rest of the world in the next few months. The price in Europe starts at €140, unsubsidized. T-Mobile is the only announced carrier in the U.S. and we don’t yet know any release or pricing info. 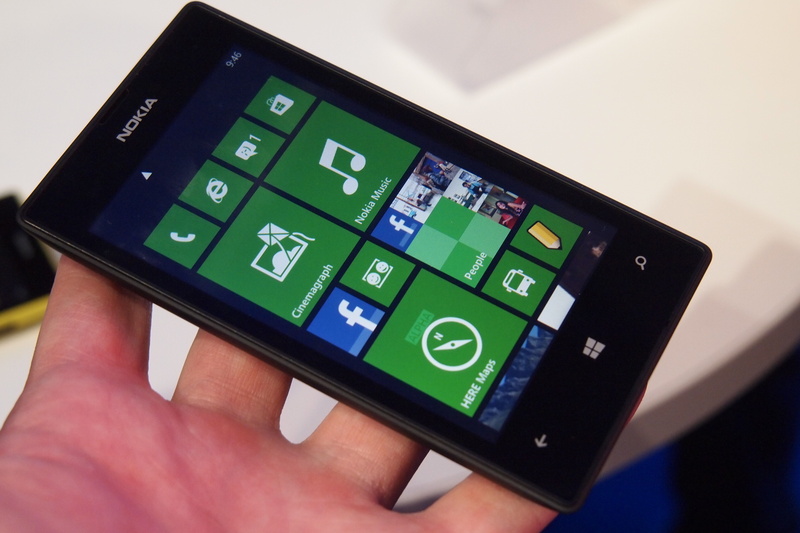 The Lumia 520 shares a design language with the Lumia 920 and 820 series already on the market. Though it’s slightly different, the comfortably curved back, pillowed/curved glass over the display, and super sensitive touchscreen are all familiar. Also familiar are specs that feel a little behind the competition, but remain in line with other Windows Phone 8 handsets. Here’s the spec breakdown: 4-inch IPS display with an 800 x 480 pixel resolution protected by 2D hardened glass with a super sensitive touchscreen that works with gloves, a 1 GHz dual-core Snapdragon processor backed by 512MB of RAM, 8GB of internal storage expandable by 64GB via microSD card. This phone is 3G HSPA+ only, no LTE, and works over the following networks: WCDMA 900/2100, 850/1900/2100, GSM/EDGE 850/900/1800/1900. Wireless radios include b/g/n Wi-Fi, Bluetooth 3.0, and GPS. The 1430mAh battery is rated to last up to 9.6 hours of talk time on 3G. Like the other Lumias, the 520 is relatively thin and light but not the skinniest in town. It measures 119.9 x 64 x 9.9 mm and weighs 124g. Other familiar elements include interchangeable backplates that come in a rainbow of bright colors – yellow, red, cyan, white, and black – that also facilitate wireless charging. Nokia is also rolling out new or improved apps and services with its new phones. Of particular note is the Here mapping system. Here Maps, here Drive, and Here Transit. These are pre-loaded and free with Lumia phones and provide turn-by-turn navigation in the car as well as simple transit directions for getting around unfamiliar cities. The Lumia 520’s rear-facing 5-megapixel camera comes with a great lens, though not the super high-end Carl Zeiss lens on the other new Lumia announced, the 720. Still, Nokia is focused on giving customers a good camera experience, so users will have access to tools for enhancing photos such as Cinemagraph, Smart Shot, and Panorama. Cinemagraph is an app that allows you to capture images that combine movement and still areas for creating photos akin to animated gifs. It’s very similar to what HTC introduced with the new One. Smart Shot takes a series of pictures and allows you to choose which one is best – again, something we’ve seen on other phones, but always appreciate when done well. Finally, the Photo Beamer feature allows Lumia owners to take over the screen on another device (even non-Nokia phones) to show off pictures with friends without everyone having to crowd around you. The camera is also capable of 720p video recording. No front camera here. That may have been a sacrifice to keep the price low. The Lumia 520 is about delivering a smartphone experience that feels high end without a prohibitive price. The starting price in Europe and Asia is €139, around $183. That’s without a subsidy. If that holds in the US market, it could end up being free or for as little as $50 on contract with T-Mobile (where it will bear the name Lumia 521), and buying it unsubsidized wouldn’t require emptying a savings account.